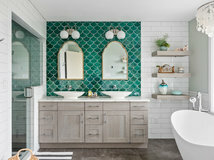 The owners of this lovely renovated bathroom weren’t happy with how the space looked before, so they hired Terri Sears of Hermitage Kitchen Design Gallery to help them make it over. 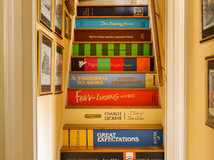 They wanted the room to feel brighter and larger but they didn’t want to change its footprint. Before: Here’s how the bathroom looked prior to the renovation. 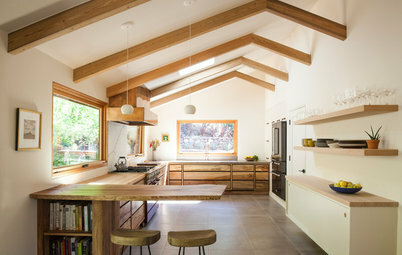 It had darker finishes than the homeowners wanted, and some of the architectural details weren’t to their liking. 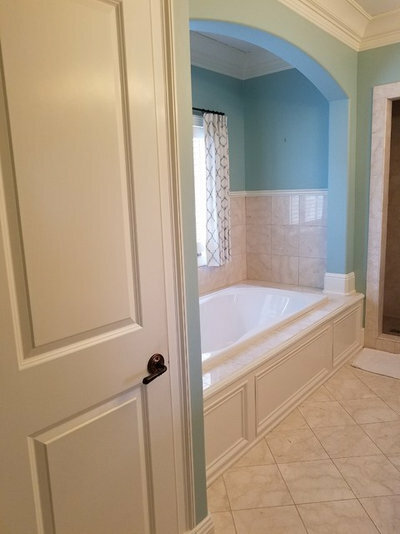 Before: For example, the homeowners didn’t like the archway over the tub. After: Sears opened up the room by removing the archway, as well as the wall that separated the shower from the tub. 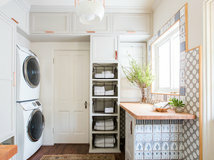 She replaced the drop-in tub with a smaller, freestanding one. The changes allow more light into the shower stall, which now has a glass panel and door. 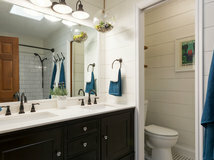 The shower walls are tiled with 3-by-12-inch white subway tile with a pale gray grout. 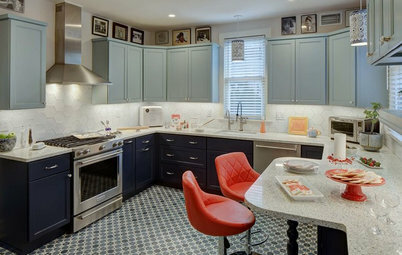 Sears chose the gray to give the tiles some definition and because it’s easier to keep looking clean than white grout. 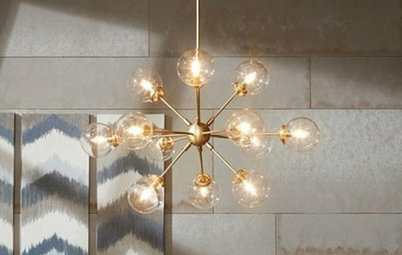 The geometric chandelier above the tub has a satin gold finish. 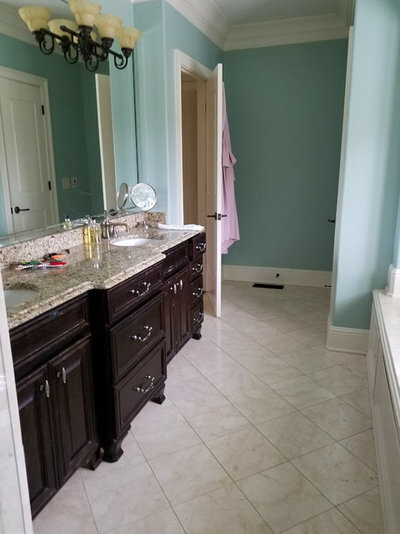 Lighter cabinets and wall paint give the remodeled bathroom a brighter, airier look. 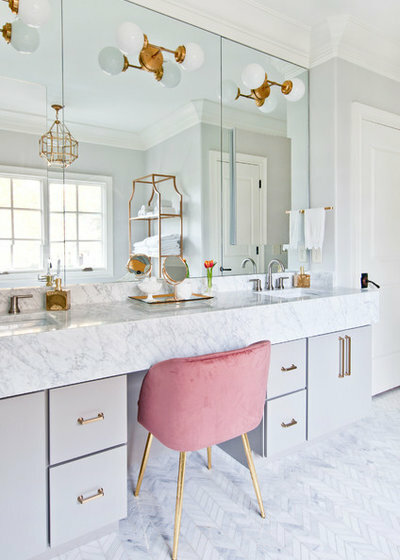 The vanity top is also Carrara marble. 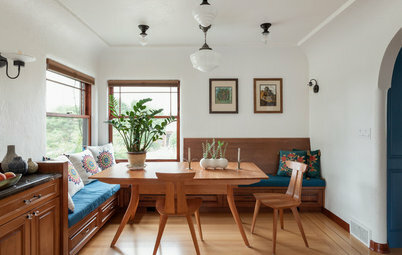 The homeowner purchased the pink chair on Houzz. 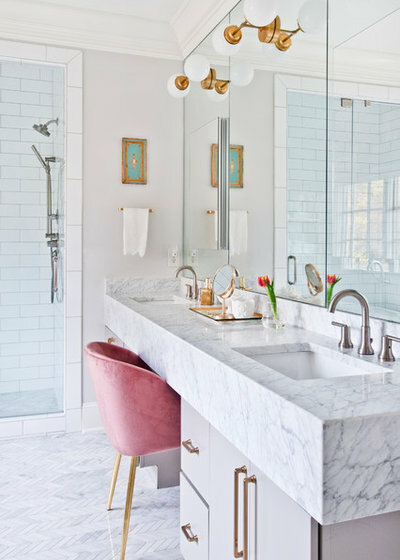 The designer mixed metals for the bathroom’s fixtures, with stainless steel for the sink faucets and shower and tub fixtures, and a satin gold finish for the lighting and cabinet pulls. 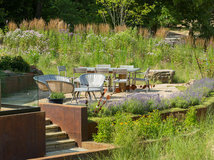 “There’s a couple reasons why we did it,” Sears said. 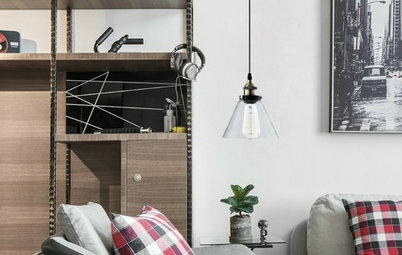 First, what’s in style for finishes changes over time, so Sears put the gold — the trendier of the two finishes — on the elements that would be less costly or complicated to replace. 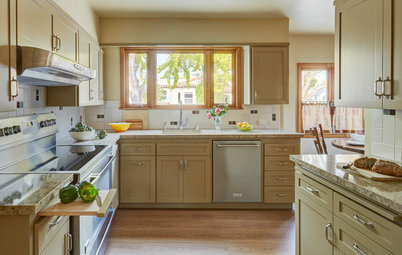 Second, adding warm gold worked in a room that has both warm and cool grays in it. 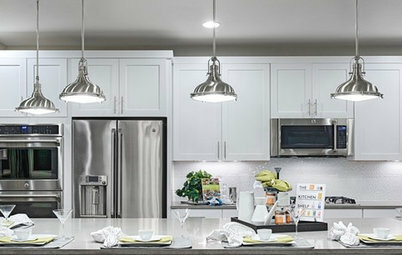 Sears placed the light fixtures directly on the mirrors rather than above them to reflect and amplify their glow. 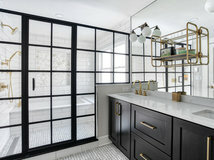 Sears centered mirrored medicine cabinets on each end of the bathroom mirrors to create more storage space. 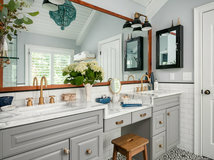 This helped to make up for space lost as a result of the apron-front style of the vanity top — it drops down 8 inches and takes up space where drawers otherwise could have gone. The homeowners had a gold etagere they wanted in the room, so Sears planned space for it near the tub. 10.75"x11.875" Calacatta Gold Hexagon Mosaic Tile Polished, Chip Size 2"
12.25"x10.75" Carrara White Hexagon Mosaic Tile Honed, Chip Size 4"
Thanks a bunch for the information. It's really appreciated. 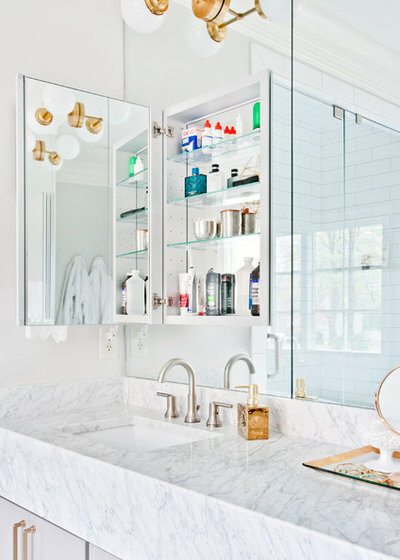 What brand is the medicine cabinet and what size? Gorgeous make over! Thank you for your kind words! 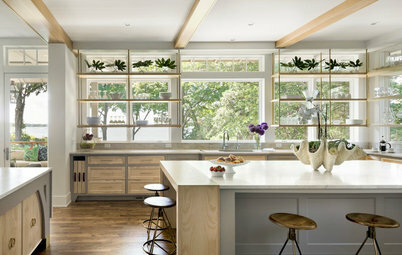 The medicine cabinets are from Kohler and they are 20"x30" Good Luck with your project!